Since March has again turned colder and since I just happened to have some overripe bananas laying around, I decided to do some baking yesterday. Wait, are you suggesting that I purposely didn’t eat those bananas the past few days just so I could make Louise’s Banana Cake? Oh, dear blog readers, you know me too well. So, as mentioned, this week’s What’s Cooking Wednesday is Louise’s Banana Cake. Perhaps you remember that my mom’s name is Mary, and my grandmother was Paulina/Pauline; if so, maybe you’re wondering who this Louise character is. Louise was my grandmother’s neighbor and “good buddy,” as she always said, whose family surely has no idea that her legacy lives on in my family in the form of an old, tattered recipe. Yes, it’s that good. In fact, it’s my second favorite cake of all time, after only the chocolate one I shared with you last month. 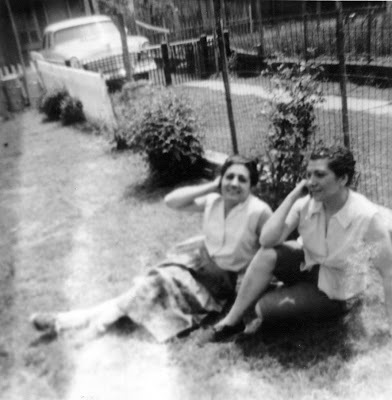 When writing this post, I remembered that I actually have some old family photos in an album here, and lo and behold, there is one of my grandmother (left) and Louise lounging about in what was at the time our half of the backyard; my family now has the whole thing (without the dividing fence) because after the whole row of houses burned down in 1971–stopping at our house–Louise’s family chose not to rebuild on the same spot; my grandparents bought the entire lot and built the house that I and my brother grew up in and where my father now lives. Check out that car in the background y’all! It’s for an ordinary 13 x 9 pan, but this time I made muffins and a loaf (looks like bread but tastes like cake!). My mom does a fabulous thing with this cake for special occasions–makes a whipped cream icing (recipe also below) and then does a layer cake, putting the whipped cream and fresh banana slices in the middle and then whipped cream, banana slices, and maraschino cherries on top with a sprinkling of walnut shavings. Yum! For those of you in Italy, you can safely make the following substitutions: (1) 225 grams of butter instead of shortening; and (2) one teaspoon of “lievito vaniglinato per dolci” in place of the baking powder and vanilla extract. 1. Mash bananas and set aside. 2. Mix together sugar and shortening, and then add eggs and beat until pale yellow. 3. Mix together the dry ingredients, and then add them to the sugar/shortening mixture, alternating with sour milk and vanilla. Batter will be thick. 4. Add bananas and the nuts if you’re using them, and beat until blended. 5. Pour or spoon into your baking vessel of choice and bake at 325°F (162°C). If baking a 13 x9 cake, it should take about 45 minutes, but check progress after a half hour or so. Muffins and loaf pans will take less time, so remove when the tops springs back from the touch and/or when a toothpick inserted in the center comes out clean. Whip (on high speed) until stiff peaks form. I love the old pictures…there’s a sort of innocence in them that I feel modern cameras can’t capture – maybe they “see” too much in color? That cake is making me hungry. Pretty picture! I love those old recipes hand-written and dog-eared. My mother-in-law has a book full of recipes hand-written in Greek! I won’t be cooking from that very soon. I am wanting me some Banana Cake now!!! Thank you for the background information and the pictures. I am going to print out the post and put the whole thing in my recipe book so I can always remember Louise! Reading your blog almost always makes me hungry! Love that old photo! Great photos! I never seem to have enough ovverripe banananaananas, but I blow my neighbors away with zucchini bread when the gardens are spewing them out so fast they are dropping them on the doorstep at night. I even showed them how to grate and freeze them to make it all winter. Hope the SO is properly grateful for this talent of yours. Thank you for the great recipe. I loooove bananas. I enjoy making old family recipes. Good food and nice memories. Boy, I am a sucker for those old black and white images. What a wonderful shot, the two women, in skirts, sitting on the ground, the beauty in their sun-kissed faces, the light, the fence, the car, the grass. Oh and the recipe looks amazing as well. Can you start doing “scratch and sniff” posts on Wednesdays? What a fantastic photo. Those were the good old days! The banana cake looks amazing as well. Great post! That looks all sorts of moist and yummy and delicious. I’m going to be thinking of this cake all day! I might have to hide a couple bananas from C and M so I can make it! I’m adding a copy of this to my recipe book. I love banana cake. That looks yummy…I love all things banana. I love the picture of your grandmother and Louise what fun to have that to include in your post. That sounds and looks yummy. I wonder if there’s a banana cake recipe out there that includes nutella. My sister-in-law freezes her ripe bananas so she always has some on hand for banana cake. i’ll be over tomorrow afternoon, hope you have some cake waiting for me? looks “yummilicious” and i like the whipped cream idea. you’ve also made me go all sappy. i’m conjuring up old memories of my gran, old photos and old houses. ohhh, i love this stuff, it makes my heart grow. i live in a house that’s 100 yrs old, and there is a lot of history here, and memories galore. ciao bella . . .
oh and i saw giulia asked for a conversion. i like this site. it’s rather straight forward, hope it helps. Glad everyone enjoyed not only the recipe but the story (and photo) behind it; I couldn’t believe that I actually have a photo of the infamous Louise here with me when I really didn’t bring very much from home at all. Fran, I love that now you’ll always remember Louise as well! Ms A, you’re so right. I can’t really pinpoint it either, but it just may have something to do with being able to see too much, shots being too exacting (and exact). Old black and whites are the best. Giulia, I can’t imagine that I’ll be so inspired to convert everything to grams (sorry! )–I brought all my measuring stuff from America 😉 BUT, I see that Cheeky has provided a link, and remember that Cristina of Expats has also put up a great conversion chart that’s really helpful. Judith, well, if you’re talking about my baking skills, those are completely lost on P, unfortunately. That along with my vast knowledge of American sports. Figures. Sharon, I have no idea what kind of car that is, although I’m sure my dad would if I remember to ask…for now, I’ll take your word for it! Anna, yes, I’ve heard of the frozen banana trick. Actually I have two in there now, but I haven’t actually used any from the freezer yet (obviously we need to eat more fresh bananas!). Thanks for the great tip! Banana cake and whipped cream frosting…yum. I almost always have cream cheese frosting to that would be a nice change of pace. Your photos are good enough to eat! I can taste the banana cake with each of your words! Peabody, thanks so much for stopping by! For those of you who don’t know about Peabody, if you like baking even a little bit, get over to her site STAT! TICheek, thank you much; your photos are always so lovely (as are Peabody’s), I’ve been inspired. For those who haven’t seen it, this is another site you *must* visit. The only difference I draw is the shape of the pan, but others might have a more exacting answer? Perhaps something in the texture? Personally, I use them interchangeably…so if I put this in a loaf pan, I’d call it banana bread (and I often do). YUM! Yum! This recipe looks like another keeper….love the photo of your family. Hugs! Pam, I can’t describe how much I love this cake…hope you like it too!